The Linksys Smart Gigabit Switch (LGS308, LGS308P, LGS308MP, LGS318, LGS318P, LGS326, LGS326P, and LGS326MP) offers a quick and easy solution to extend your office network. 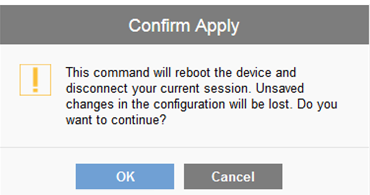 You can restart or reboot the switch through its web-based setup page or by manually by pressing the reset button on the device. Using a pin, press and hold the reset button for less than 10 seconds. NOTE: The SYSTEM light will blink fast and the system will reboot. On the web-based setup page, click the Maintenance tab. Click Reboot in the left panel, then click the Reboot button on the page. When the confirmation prompt appears, click OK to continue.